Nano Char is derived from bamboo feedstock, produced at 500-600℃ Pyrolysis in the absence of oxygen. Its properties include high fixed carbon content ( 75% - 95% ), very large internal surface area, high mineral content ( K, Mg, Si, Mn, Zn ), etc. The application of Nano Char is significant to agriculture, due to its physical and chemical properties. Nano Char has a good performance of adsorption, due to its Onion-like Fullerene strure ( C60 ) and a large amount of surface oxygen functional groups. The surface area of Nano Char is 2.5 - 3 Times than that of wood char and adsorption capacity is more than 10 times that of wood char. Nano Char is alkaline with lots of cations in bamboo ash, such as Ca, Mg, K etc. Which can improve the soil pH by reducing the amount of H+. Nano Char can increase the Cation Exchange Capacity ( CEC ) in soil, ectc as slow releasing agent of the nutrients, substantially reduce the need for additional fertilizers. 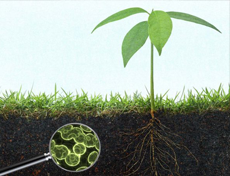 The micropores of Nano Char, adsorb moisture and nutrients is soil, provide beneficial microorganisms with a favorable habitat, which will increases microbial life. 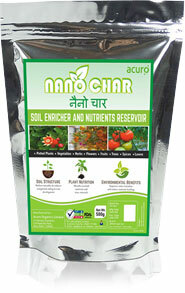 Nano Char also benefi soil contaminated with pesticide, heavy metals etc. By passivating the contaminante.